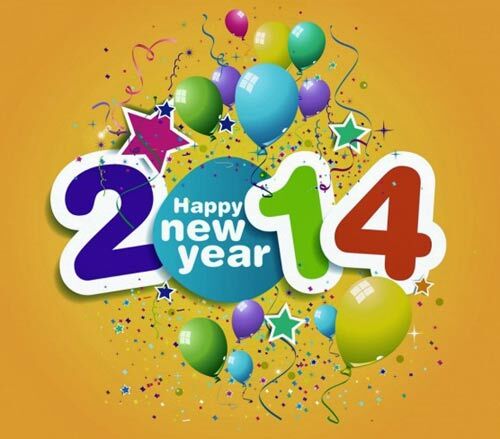 Here are the rankings of New Zealand blogs with publicly available statistics for December2013. Ranking is by visit numbers. 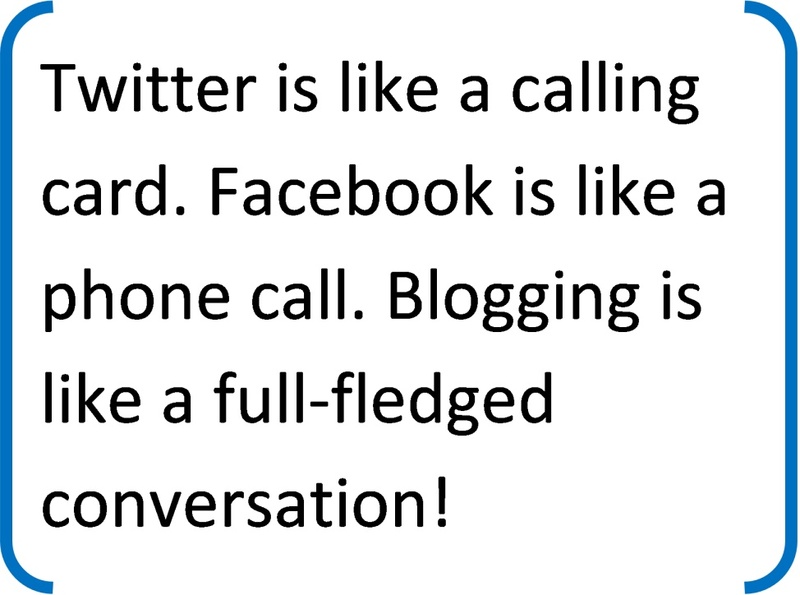 I have listed the blogs in the table below, together with monthly visits and page view numbers. This is Paul Connett’s response to Ken Perrott’s last article The fluoride debate: Response to Paul’s 6th article. Here is my response to Ken’s last response to this thread (part 4). 1) The pictures below appeared on page 2 of a 4-page leaflet from Queensland Health used to promote mandatory fluoridation in 2007. It compares pictures of the teeth of a child who has had its teeth “exposed to fluoridated water” (beautiful) with the teeth of a child “without exposure to fluoridated water” (atrocious). Why does Ken say “seems”? I forwarded a copy of the whole leaflet to Ken. Does he doubt the authenticity of that leaflet? I have no doubt at all about its authenticity. Mind you, I am not surprised – now that citizens in Queensland have pointed out this outrageous piece of state-funded propaganda – that Queensland Health is embarrassed and should want to hide all traces of it. 2) I think it was disingenuous of Ken to try to nullify this outrageous propaganda by providing a link to a leaflet produced by an anti-fluoridation group. The point I was making (in part 3 of this thread – originally part 1A) is that it is one thing for citizens – either promoters or opponents – to use tactics like this (I certainly do not condone or endorse any side using such tactics) but it is quite another when bureaucrats working for the state and paid by taxpayers to protect their health stoop to such tactics. It is unacceptable. Nor should it be necessary if this practice was as “safe and effective” as the promoters claim. Surely the role of civil servants is to provide objective information on a controversial issue not side with one side and then provide outrageous spin in support of that side. 3) Ken did not respond to my other concerns about the propaganda used by Queensland Health. This is less dramatic perhaps but equally deceptive. 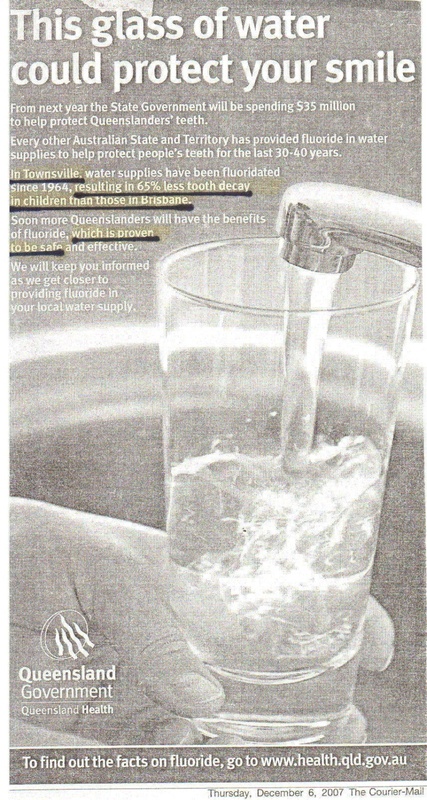 This was their claim in newspaper ads (see picture below) that there was a 65% difference in tooth decay between fluoridated Townsville and non-fluoridated Brisbane (see picture below). To get this 65% reduction Queensland Health had selected the number for the relative difference for just one age – 7 year olds. In Table 4 – in the paper by Slade et al., (see below) readers will see that this 65% relative reduction amounted to an absolute saving of a measly 0.17 of one tooth surface. Their arithmetic is accurate but a 65% reduction sounds a whole lot more impressive than a saving of 0.17 of one tooth surface. This is a deliberate attempt to mislead the public. In other words, it’s PR spin. I would be interested to hear how Ken would describe it. 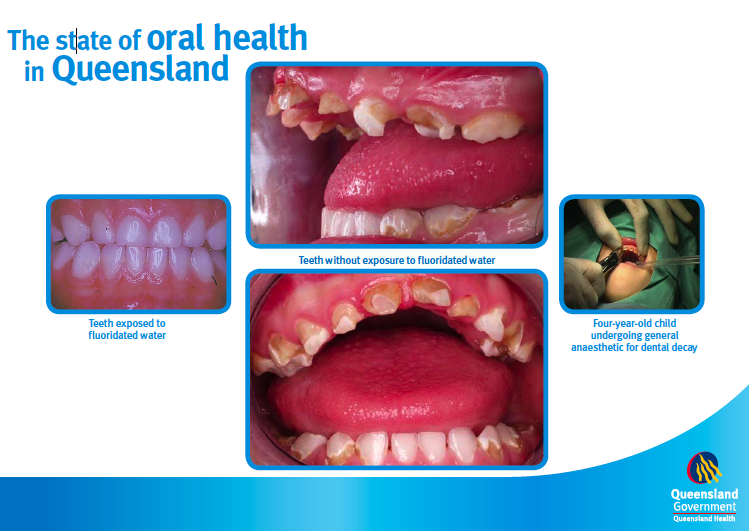 Returning to the photographs in the Queensland Health brochure, does the difference in these two sets of teeth look like a difference of 0.17 of one decayed, missing and filled permanent tooth surfaces (DMFS)? I wish I could say that this blatant propaganda on behalf of personnel at Queensland Health is an aberration among civil servants in the health agencies of the countries practicing fluoridation. Sadly, from my personal experience, it is not. I have seen first hand outright propaganda from people at the highest levels of civil service in the health agencies of several fluoridating countries as well as their minions in their bureaucratic chain of command. The propaganda of these civil servants is shameless but sadly gobbled up by the media and too many local decision makers in their respective countries. 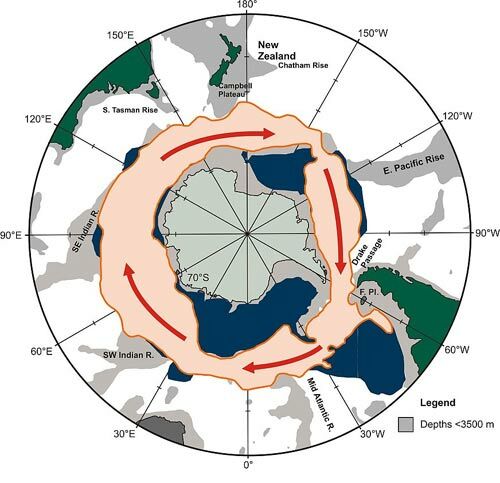 One would have hoped that scientists like Ken Perrott with their sensitive antenna to scientific misrepresentation would have helped expose this sad state of affairs. Instead of doing this they fire their rhetorical guns at the citizens who are doing their very best – with limited resources – to bring this state-financed propaganda to the attention of the media, the public and their political representatives – but it is an uphill job. 4) In NZ the manipulation of the science on this practice goes back a long way – in fact to the very first trial of fluoridation in Hastings (with Napier as the control city). This trial was carried out from 1954 to 1964 and has been shown by the late Dr. John Colquhoun and his PhD thesis advisor Dr. Robert Mann and others to have been a scientific fraud (Colquhoun and Mann, 1986; Colquhoun, 1987 and Colquhoun and Wilson, 1996). 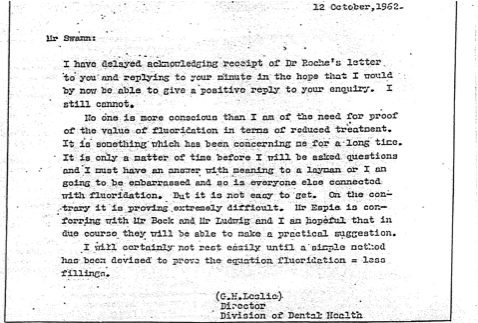 5) Ken might wish to comment on the following candid letter sent out by the Director of the Division of Dental Health, Dr. G. H. Leslie, in 1962 – some eight years into this 10-year trial. 6) With this letter we have what amounts to a “smoking gun” as far as the inability of NZ dental officials and researchers to show the effectiveness of fluoridation – some eight years into the ten-year Hastings-Napier fluoridation trial. 7) However, miraculously, two years later this trial was proclaimed as a great success at demonstrating that fluoridation had led to a large reduction in tooth decay (over 60%) and the result was used to push for fluoridation throughout the country. 8) So how in the space of two years was this dramatic turnaround achieved? 10) To the best of my knowledge the evidence that Colquhoun and Mann put forward for this rigged trial has never been refuted. I would be anxious to see if Ken can throw a different light on this matter. If he can’t then I think that he and other NZ citizens should be concerned that the people of NZ were duped in this way. Ken was unresponsive to many of my other concerns expressed in parts 1 and 1A (or parts 1 and 3 in my thread, The Arguments Against Fluoridation). 11) Ken didn’t address the key issue of the difference between concentration and dose when comparing artificially fluoridated communities and naturally fluoridated study communities when harm has been identified. 12) He didn’t address the need for a margin of safety calculation when determining a safe dose for a community based on a human study that has found harm (see chapter 20 in The Case Against Fluoride…). Nor did he comment on the sample margin of safety analysis that I provided based on the Xiang et al. (2003a,b) study, although he has commented on the Xiang study elsewhere. Is he suggesting that in order to get a rational response from him on this matter I have to take him to court? Joking apart, surely he can concede that the purpose of fluoridation is to treat people as opposed to treating the water to make it safe or palatable to drink? And if he is willing to concede that then doesn’t treating people – at least in some countries – require that those treated have the right to informed consent to that treatment? This is not just about semantics it is about fundamental human rights. See the definition of medicine and medical treatment under EU law which I provided in the other thread (part 6). 15) Instead of providing me with examples of statements from countries in Europe that have rejected fluoridation for reasons other than the two main ones I cited, Ken fobs me off with a statement from the NZ National Fluoride Information Service. In this statement this body gives no specific examples of countries that have not fluoridated for the reasons it – or Ken – states. So I will ask him again. Ken please provide some evidence that countries have not fluoridated for the reasons you have given as opposed to the reasons I have given, namely: they do not wish to force fluoridation on people who don’t want it and they argue that there are unresolved health concerns about the practice. Ken has essentially ignored all the information I provided for him on this issue. I provided the figures cited by the CDC (2010) for dental fluorosis for children aged 12 to 15 in the US. In this report, they indicate that very mild dental fluorosis impacts 28.5% and mild dental fluorosis impacts 8.6% of the population in question. Mild dental fluorosis affects up to 50% of the tooth surface and presents potential psychological problems for young teenagers. Ken may not consider that a “real” problem but many teenagers do. Ken might also be interested to know that Trendley Dean, the so-called father of fluoridation , who developed this first classification of dental fluorosis in the 1930s, in testimony before the US Congress stated that mild dental fluorosis was an unacceptable trade-off for reduction in tooth decay (see chapter 11 in The Case Against Fluoride…). Moreover 3.6% of US children aged 12-15 have dental fluorosis in either the moderate or severe category. In these categories 100% of the enamel of the impacted teeth is impacted. Neither of these categories is desirable. 3.6% of all the children aged 12-15 in the US is a lot of children! 17) Ken also claimed that there was practically no difference in dental fluorosis prevalence between fluoridated and non-fluoridated communities. He ignored my response. I cited the study by Heller et al (1997), which clearly showed that that was not the case. They found that as the fluoride levels rose from a) less than 0.3 ppm, to b) 0.3 to 0.7 ppm , to c) 0.7 – 1.2 ppm and then d) above 1.2 ppm there was a marked increase in dental fluorosis rates. 18) I offered an animal study (Varner et al, 1998) in which rats were exposed to 1 ppm fluoride (administered either as AlF3 or NaF) for one year and experienced harmful effects. I provided this reference because Ken stated that he paid no attention to animal studies performed at high concentrations and that was all he was offered by opponents of fluoridation. However, I got another brush off from Ken. He claimed that he couldn’t find the whole study by Varner et al – only the abstract – and after a few words on the abstract then stated, “I won’t comment further on this.” First, of all I am surprised that no University in the Hamilton area carries the journal Brain Research where the Varner paper appeared. Also if Ken was having trouble finding this all he had to do was email me and I would have forwarded him a pdf copy of this paper. For future reference I would be happy to do that for all the papers I cite. 19) Nor did Ken respond to the discussion in which I pointed out that the US Food and Drug Administration classifies fluoride for ingestion as an “unapproved drug.” This means that in the U.S. fluoride intended for ingestion has never been subjected to the double blind randomized control trials (RCT) for efficacy that are required of all other drugs. Nor is the FDA tracking side effects from patients or doctors, despite the fact that many individuals claim to be highly sensitive to fluoride’s toxic effects. The same professional and regulatory neglect appears to have occurred in all other fluoridated countries, including New Zealand. Note: I have raised more specific questions about this professional and regulatory neglect in my latest response (part 6) in the other thread. Ken did not acknowledge this important difference. For the second time Ken chose not to respond to these concerns. Ken is certainly very sensitive to the treatment of low-income families because of his own personal history but he seems not to be as sensitive to the fate of these subsets of the population. Now I will attempt to respond to some of the issues that Ken did comment on. 25) I agree with Ken that I was a little hasty in dismissing the Irish data comparing tooth decay in the Republic of Ireland and Northern Ireland. However, the larger point I was making was this: if indeed it is legitimate to compare these two populations (and there are both cultural and genetic differences) then the more urgent need is to compare the status of various health concerns – which may or may not be caused by or exacerbated by fluoride – between the two countries. However, even though fluoridation has been mandatory in the Republic since 1963, the health authorities there have not attempted a single study comparing the health of communities which are fluoridated and non-fluoridated, either within the Republic itself or between the Republic and the North. Like most fluoridated countries (including NZ) they are flying blind on health concerns. 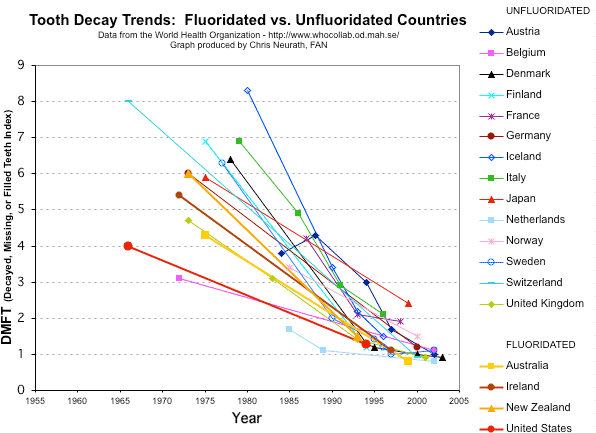 26) I think the value of comparing tooth decay between countries is to note that tooth decay rates have been coming down in both fluoridated and non-fluoridated countries at similar rates. Avid promoters of fluoridation such as the Oral Health Division of the CDC often forget this and try to claim that fluoridation has been coming down in fluoridated countries because of fluoridation when similar declines have occurred in non-fluoridated countries over the same period. 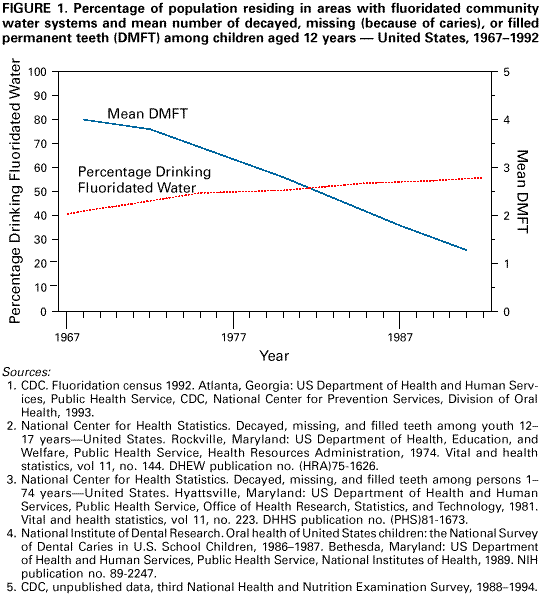 See the CDC’s ridiculous Figure 1 in CDC (1999), (see figure below) which purports to show that tooth decay in 12-year olds has come down in the US over the period 1960s to the 1990s because over the same period the percentage of the US population drinking fluoridated water has increased! I urge readers to compare this CDC figure with the figure summarizing the decline in tooth decay in many different countries – both fluoridated and non-fluoridated countries – covering the same period (and beyond) cited by the CDC. 27) I agree with Ken that whenever we cite the CDC (1999) statement that fluoride’s predominant mode of action is topical not systemic we should not omit the word predominant. I usually do this. He found one example when I didn’t. 28) I have conceded in another post that I was wrong in suggesting that Ken believed that the delivery of fluoride’s topical effect was via the saliva generated in the salivary gland. However, if Ken rules out a significant role for the fluoride delivered by the salivary gland, and instead that the topical action is delivered directly in the mouth, why are we forcing people to swallow fluoridated water at all? Especially adults where no tooth development is involved once their teeth have erupted? Why instead, is he not merely advocating swishing and spitting out fluoridated water, or fluoridated mouthwash or using fluoridated toothpaste. 30) In challenging Ken’s notion that the only animal studies we quoted had very high fluoride levels. I responded that it was well known that you needed to treat rats with 5 to 10 times as much fluoride to reach the same plasma levels as humans. Ken responded by pointing out he could find only one reference to this and cited the NRC (2006) commentary on Dunipace’s work (Dunipace, 1995). The NRC characterized Dunipace’s conclusion as showing that “rats require about five times greater water concentrations than humans to reach the same plasma concentration.” (Appendix D, p. 442). However, there are several other studies that have suggested the same or even a higher ratio than 5 is needed. That is a ratio of 12.5. Clearly this comment from Slott, “an avowed profluoridationist,” is meant to throw doubt on the credentials and integrity of my colleague Bill Hirzy. I have known Bill for over 15 years. I first met him when he was working at the US EPA. At that time he and other professionals at the EPA were very concerned about the way that administrators in this agency felt that it was OK to force professionals to “bend their science and their statements” to fit into their policy judgments. This concern began in 1985 when a scientist at the EPA admitted that he had been forced to go along with a determination that the safe MCL for fluoride was 4 ppm, when he knew that this level wasn’t safe. This professional and others at the EPA knew that the administrators were bowing to political pressure from politicians (e.g. Strom Thurmond) in certain states with areas of high natural fluoride and who were concerned that if a lower level was set for the MCL it would cost their states a lot of money to remove the fluoride. As a result of this Dr Robert Carton and others set up a union at the EPA headquarters in an attempt to get a code of scientific integrity adopted at the EPA. This would forbid administrative staff from forcing scientists to make false statements about their scientific findings in order to fit into the “policy” of administrators. This same union after examining the scientific evidence came out in strong opposition to the so-called safety of the MCL and the MCLG for fluoride, both of which had been set at 4 ppm, and also the practice of water fluoridation. Those who are interested can view Dr. Hirzy’s statement before a Senate subcommittee in the US Congress in 2000 (http://fluoridealert.org/fan-tv/hirzy/ ). Clearly, Bill’s opposition to fluoridation is science-based. Moreover, in a democracy like the US, like any other citizen, including Steve Slott, he is entitled to his opinion on a public policy issue like this, without being treated like some paid hack. When Bill retired from his teaching position, Fluoride Action Network was only too happy to have such a qualified person work as our point person in Washington, DC. We have paid him a nominal salary to do this. That shouldn’t be used to suggest that he has somehow thrown science and his integrity out of the window, which I think Slott meant to imply when he says Bill is a “paid lobbyist for Connett’s antifluoridationist group, FAN.” Based on the science Bill is opposed to fluoridation. Based on the science FAN is opposed to fluoridation. It is a shame that Slott should think – or intimate – otherwise. As far as lobbyists are concerned I think Steve would do better to wonder what the ADA is doing with 20 paid staff in DC, all of which are receiving a remuneration, which makes Bill’s nominal salary look like a pittance. One of the things that ADA is doing with its $100 million budget is to try to persuade Congress and state health departments not to allow dental therapists to perform basic dental procedures in low-income areas. Ironically, I believe that Steve is against the ADA’s position on this sensible and cost-effective measure. 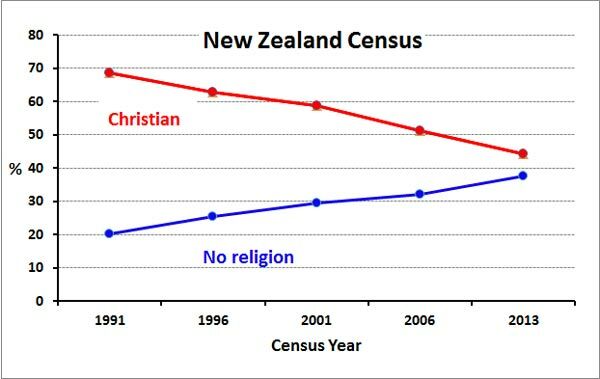 It has proved most successful in NZ. In my view Bill Hirzy is an excellent educator on this and other issues. We believe that he can help with a lot of education in Washington, DC, not just with legislators but with the city council and with environmental and other public interest groups. A lot of people in DC respect both his experience and his integrity. In a paragraph headed in bold type Perrott cites my activism as reason to question my ability to properly assess risks. I freely admit making an error (soon to be rectified by publication of a corrigendum) in the annual cancer incidences for HFSA and pharmaceutical sodium fluoride. That said, nevertheless EPA did not find fault in my determination that HFSA causes about 100 times more cancer than pharmaceutical sodium fluoride. Neither does Perrott show any fault in that determination. Perrott comments about my dismissal of NSF’s statement about their testing allegedly proving the amount of arsenic contributed by HFSA is non-detectable and perfectly safe, but he fails to address my observation that NSF in fact reports measurable amounts of arsenic contributed by treatment chemicals, and that those levels lead to 200 times higher cancer risk than USP NaF. In a debate one should address points raised by one’s opponent – if one can…..
After doing some calculations based on the New Zealand Specific Impurity Limit for arsenic, I do admit that the New Zealand standard is superior by a factor of 2.4 to that of NSF. That is, however, faint praise in that it allows about 500 fold higher lung/bladder cancer incidence than pharmaceutical grade sodium fluoride. See below. Regarding the arsenic levels in HFSA and Mr. Perrott’s being “suspicious” about my results and whether the HFSA samples I reported on were representative, Mr. Perrott cites the Brown et al. 2004 publication in the Journal of the American Water Works Association and kindly provided a link to the article. If he had read that article closely he would have noticed the support for my work on page 118. At page 118 of that piece, Brown et al. report testing 4 samples of HFSA, rejecting one because of excessive free HF, and finding arsenic levels of 9, 20 and 47 mg/kg, in the other three samples, all of which values fall within the range of the 33 samples I cited in my statistical analysis of arsenic levels in HFSA. Further on page 118, Brown et al. cite results from Weng et al. reporting on an unstated number of HFSA samples, finding an average of 28 mg/L and a maximum of 60 mg/L of arsenic – again within the range of my analysis. Finally, also on page 118 is citation of work by Casale, who found a range of 9.4 to 58.5 mg/L of arsenic – within the range of my analysis. Concerning activism and suspicion, perhaps Perrott is correct in asserting that higher purity HFSA is available in New Zealand, but his activism in promoting fluoridation could raise parallel suspicion about that. Perrott dismisses as “a silly conspiracy theory” my recitation of data published by the U.S. Geological Survey (USGS) showing that 94% of the byproduct HFSA produced by phosphate manufacturers in 2011 was sold to water fluoridation systems, and coupled with solid data on sales prices, produced about $560,000,000 in revenues for those companies. If only 6% of HFSA found alternative markets, which USGS found to be valued by the producers at nearly double the value for the fluoridation market, where else would HFSA go than down our shower drains and toilets, etc. Pretty good business model for a “silly conspiracy” I’d say. Assume density of 20% assay HFSA is 1.2 g/mL (density of 24% assay is 1.24g/mL). Using the USEPA modified population Unit Risk value of 3.5 x 10-5/(ug As/L), a risk for lung/bladder cancer of 1.5 x 10-5 obtains. This is equivalent to 15 extra cancers per million population exposed for 70 years. New Zealand’s SIL for arsenic is about 2.4 times more protective than the U.S. standard. If pharmaceutical grade NaF had been used for this same period, delivering 0.00084 ug As/L, then New Zealand’s 4 million people exposed for 20 years may have developed about 0.03 such cancers. 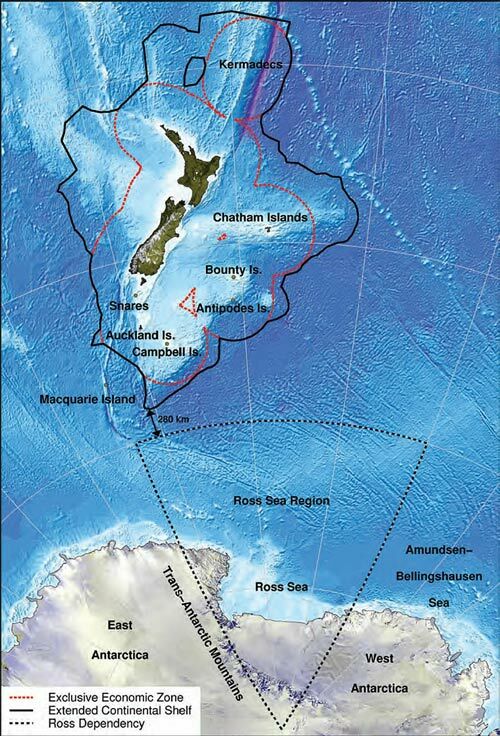 If the New Zealand government were to have provided 4 million people with 2 L/day of water containing 0.50 mg added fluoride from pharmaceutical grade NaF for 20 years (and it is very likely that far fewer than 4 million would have opted to drink that water), it would have spend, in constant 2001 U.S. dollars, about $190,000. If HFSA had been purchased at about half the price charged in the U.S., i.e $800/metric ton over that same period, and assuming New Zealanders use half as much water per capita as U.S. citizens, i.e. 50 U.S. gallons/day, and this practice ran for 20 years, then about $6,000,000 would have gone to phosphate producers. And, by the way, the New Zealand Lung and Bladder Cancer/Fluoridation Lottery could be cancelled too. Postscript. This will be my last contribution to this thread. I feel that I have presented my case fully in the book I co-authored (The Case Against Fluoride…). What I am more interested in now – having outlined some basic arguments against fluoridation in this thread (few of which have been satisfactorily rebutted) – is seeing what scientific case Ken can produce for fluoridation. This is meant to be the substance of the other thread and that is where I will now focus my efforts. 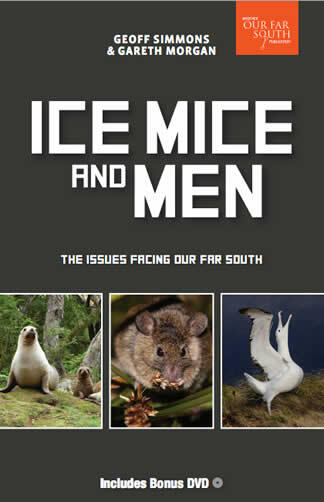 In this respect I have been disappointed in Ken’s ability – after four attempts to do so –including the last installment that he published yesterday (Dec 10) – to lay out a scientific case. So far Ken seems more adept at theorizing on why drinking fluoride should work rather than providing the studies that it actually does. In addition, he spends more time demonstrating his disdain for anyone opposed to fluoridation than actually producing the science which shows that fluoridation is “safe and effective” as proponents repeatedly claim. Finding fault with me or other opponents does not establish a case FOR fluoridation. It is a practice forced on millions of people that don’t want it. He defends this practice and as such it his obligation to present a scientific case FOR fluoridation and I am still hoping that he will do that. a) What primary scientific research Ken has read that gives him the confidence that the epidemiological evidence is overwhelmingly in favor of fluoridation providing a significant benefit over and above the use of fluoridated toothpaste. b) What his response is to the latest news from Scotland that a simple and cost-effective strategy has been devised that has been found to combat tooth decay in low-income children which does not involve forcing people to swallow fluoride who don’t want to. c) A presentation of a weight of evidence analysis that would allow him and other promoters to dismiss all the concerns I have raised about fluoride’s impact on the brain and several other tissues. We have presented this case in our book and again in both these threads. Our case is in black and white and documented, where is his response in black and white and documented? c) the basis for his confidence that there is an adequate margin of safety (see chapter 21 in our book) to protect everyone in a large population drinking fluoridated water – especially the most vulnerable – from any harmful effect. I will continue to pursue his response to these challenges in the other thread: Ken’s Arguments For Fluoridation. Angmar-Månsson B, Whitford GM. (1982). Plasma fluoride levels and enamel fluorosis in the rat. Caries Res. 1982;16(4):334-9. Dunipace AJ, et al. (1995). Effect of aging on animal response to chronic fluoride exposure. Journal of Dental Research 74(1):358-68. Varying Water Fluoride Concentrations,” Journal of Public Health Dentistry 57, no. 3: 136–43. Sawan RM, et al. (2010). Fluoride increases lead concentrations in whole blood and in calcified tissues from lead-exposed rats. Toxicology 271(1-2):21-6. Slade, G.D., A.J. Spencer, et al. (1996). “Caries experience among children in fluoridated Townsville and unfluoridated Brisbane.” Aust N Z J Public Health 20(6): 623-9. Neuronal and Cerebrovascular Integrity,” Brain Research 784, no. 1–2: 284–98.